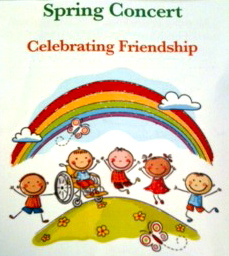 Max recently had his spring concert. The week before, I got a promising email from his teacher: "I am happy to tell you that Max did a great job at the dress rehearsal. He waited in a quiet area as the other children sang and when it was our turn he joined the class (with some hesitation) but then he happily performed. He was so excited afterward as well. We high fived and congratulated him." I was so psyched. I took the morning off from work and headed to the school, me and my high hopes. Max's class was slated to sing "Friendship Rap" and "You're A Friend of Mine." I crouched down between the two aisles of seats, right in front, camera in hand, eager for the kids to come out. When they did, Max made a beeline for me. I gave him a hug and sent him back to the row of kids lined up in front of the crowd. Let me just say that this was already a score; Max has a history of melting down at these events. The fact that he was smiling and that he agreed to rejoin the class (instead of staying glommed to me) was major. Our family actually has a history of stage fright. Sabrina was once in a dance recital at 3. As all the other little ballerinas pranced around to the Sesame Street theme song, Sabrina just stood there and stared into the audience. Literally. The only time she moved was when it came time to take a bow, at which point the audience broke into wild applause. The performance started. Max just kept smiling at me. He didn't sing or do any of the hand gestures. And you know what? I wasn't at all disappointed. I was genuinely thrilled he was content up there. And proud of him. He ran into my arms after the performance was over, and we had the best hug. If there's one thing I've learned about raising Max—and Sabrina—it's this: Our kids may not always live up to our expectations, but as long as they're happy, it's all good. Once you accept this, you'll be happy too. Congratulations to Max. Conquering stage fright is a major accomplishment. Yep, I've got a surly "no way/won't do it" oldest and a diva youngest who wants to be the star, the director and the producer of everything! Though I share no DNA with my oldest, something must have rubbed off, because I was that way too--I had no interest in performing and would be petrified to even try. Terminal shyness! Good for Max--the important thing is that he had fun with his classmates. 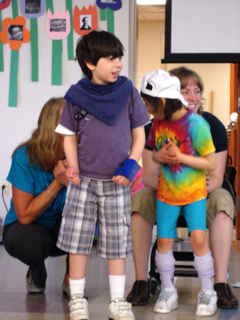 Every time I attend one of my kid's school plays, my face hurts afterward from smiling so much. From the child who says her lines a little too loudly, to the one picking his nose in the corner, the wiggler, the Diva, the one staring off into space, the one who races off stage and into his mother's arms...just kids being kids. To me, it's the "imperfection" that makes children's performances so PERFECT. I'm proud of Max for getting up there but mostly I'm just proud of Max for being Max! Proud of you Max. I was filling up reading this. Well done that man. I remember Ashley's first performance, he sat in his chair staring out at the audience and started clapping a little. I was fit to burst when I saw that. Now he takes it in his stride and even stood with his frame this last Christmas! Your ending quote has given me more insight than a year in therapy. Thank you for writing this blog! You are such a smart mommy! I was tearing up with pride for both you and Dude Max. Our kids may not always live up to our expectations, but as long as they're happy, it's all good. Julia, I couldn't stop smiling either. My eyes were mostly on Max, but seeing all the kids do their thing was incredible. Kris-Ann: That'll be $95 for this session. Tee, hee. It took me years to understand that. And I didn't get it from a therapist, either. This is so true. It is great when our kids do all expected of them but taking part and being involved is a huge thing and being happy is all we can ask for our kids.